Participate in the Peach Dessert Contest at the Lexington County Peach Festival! Enter your original Classic Peach Cobbler or other Peach Dessert for the chance to win cash prizes! Participate in the Peach Dessert Contest at the Lexington County Peach Festival! 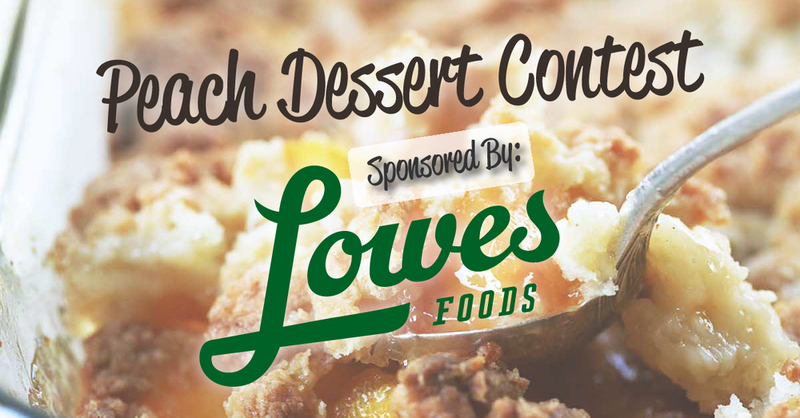 Enter your original Peach Dessert recipe for the chance to win cash prizes! This year's contest will be held on the Saturday before the festival: June 15, 2019 in the main lobby at Gilbert Primary School. Please find all contest requirements and prize information below Good luck! Each recipe must feature at minimum 2 cup fresh peaches. Each recipe must be original to the participant. The Lexington County Peach Festival reserves the right to disqualify any recipe that it feels is not original. The judge’s decision is final. All recipes must be written clearly on this official form. If additional space is needed, please attach a separate page to the entry form. The recipe must be typed or printed clearly. Entries will be accepted in the Gilbert Primary School Cafeteria on June 15 from 2:00 p.m. - 4:00 p.m.
Judging will begin promptly at 4:00 P.M. No entries will be accepted after this time. Participants will not be allowed in the judging area during judging. Awards will be announced on the Main Stage during the Festival on July 4th. Judges will select winners on the basis of texture, excellence in flavor, appearance, originality and effective use of peaches. All entries become the property of the sponsors and the Lexington County Peach Festival. No entries will be accepted unless they are in disposable containers. There will be two areas of competition in each of the two separate classes – ADULT class & STUDENT class. Two areas of competition include: Classic Peach Cobbler and Other Peach Desserts. Students’ entries will not be judged against Adult entries. Each (Adult and Student) competition will have its own prizes. Students are defined as anyone 18 years of age and younger. Professional Chefs are not permitted to participate in the contest.